Amazon India on Friday announced its that it will be holding a Freedom Sale from August 9 - August 12, to mark the month of India’s Independence. The sale will kick off at 12:00 am midnight on the August 9 and will last until 11:59 pm on August 12. The Amazon Freedom Sale will feature over 20,000 deals on smartphones, major appliances, electronics and more. Last month, Amazon hosted a Prime day sale which was exclusively open to Prime members. However, the Freedom sale is open for everyone. The sale will see the launch of many new products, along with cashback offers and discounts. According to the company, the Freedom Sale will offer up to 40 percent discount on mobile phones & accessories and a 50 percent discount on consumer electronics. Users can also expect major discounts on Amazon devices like Echo, Echo spot, Firestick, Kindle e-readers and more. As per the landing page on Amazon.in, customers can expect deals on brands like OnePlus, Huawei, Honor, Samsung, Vivo, RealMe, 10. Or, LG, Bajaj, JBL, Sony, Intel, Lenovo, Seagate, Canon, Sennheiser, WD, and others. Given the list of brands, one can expect everything from phones to Bluetooth speakers, headphones, hard disks, and other peripherals to go on sale during Amazon’s Freedom Sale. Large appliances like TVs, refrigerators, washing machines and more will also see discounts of up to 40 percent. Amazon Prime Members can expect special deals and discounts during the sale. Amazon is teasing up to 60 percent discount for Prime members on PC accessories. The Garmin Vivofit 4 will be available to Prime members at a discounted price of Rs 4,799, which is marginal Rs 200 discount on the fitness band. More exclusive deals can be expected by Prime members. 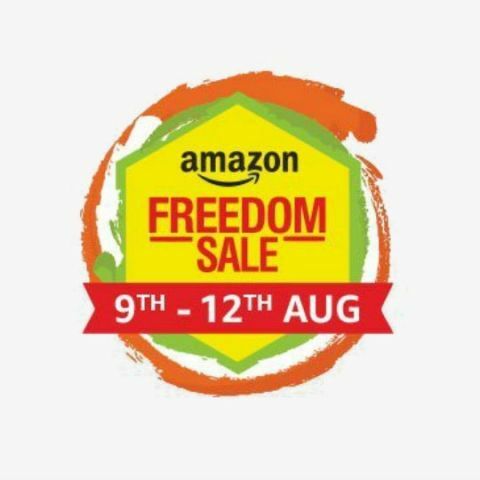 As always, Amazon is also hosting a contest around the Freedom Sale, with products worth Rs 4 lakh up for grabs. Some of the prizes include a OnePlus 6, A JBL Pulse 3 Bluetooth speaker, iPhone X, MacBook Air, GoPro Hero 5, HTC Vive, Nikon D5300, and, HTC Vive. You can know more about the contest here. On the Freedom Sale, customers will also get an additional cashback of 10 percent on using SBI Credit & Debit cards. Moreover, shoppers are also eligible for EMI payments on debit cards from select banks.